ERP/Accounting Systems are powerful back-office systems that act as the foundation for many parts of your business operation. However, if you also require access to specialized solutions, such as your warehouse management system, you need a way to make both systems work seamlessly together, with full visibility. An ERP/Accounting Connector Integration, such as the one SphereWMS offers, allows the two systems to function as one complete solution. You don't have to worry about whether your data is accurate and up-to-date, since your data flows back and forth directly with SphereWMS and stays synchronized. Why Is it Important to Have SphereWMS Data in Your ERP/Accounting System? Accurate information is a must for optimizing your warehouse operations. If someone has the wrong purchase order numbers or has a week-old version of inventory adjustments, they will find it nearly impossible to do their job correctly. Synchronized data between SphereWMS and your ERP/Accounting System with the ERP/Accounting Connector Integration saves your business time and money in several ways. First, you automate business processes that previously required data entry or other repetitive input. In addition, the data comes straight from the source, so it provides real-time insights into what's going on with your warehouse and associated operations. Managers and other leaders also have improved visibility and access to relevant data so they can base their decisions on this information. You don't need much in the way of accuracy or efficiency improvement to see significant gains. Whether you're looking at direct revenue increases or cost reductions you can attribute to the ERP/Accounting Connector Integration, or the ability to pursue opportunities you previously had to pass up, rest assured you're getting a great ROI. 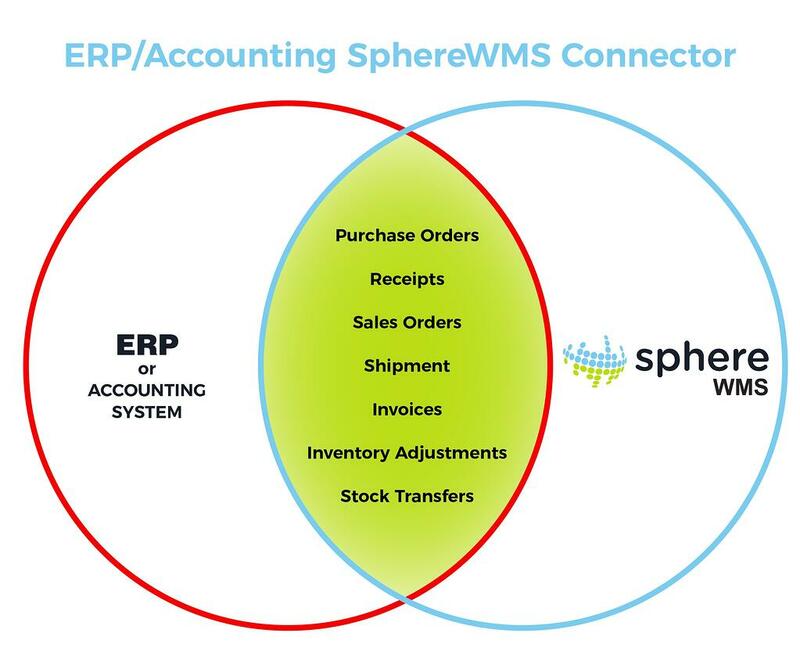 How Does the SphereWMS ERP/Accounting Connector Integration Work? The power you get from these two solutions coming together as one empowers your business to optimize operations and achieve your business goals. You'll never have to worry about data quality issues when you have all of your specialized systems working together seamlessly with SphereWMS ERP/Accounting Connector Integration.